Steel rods suspended from the roof beams support the horizontal wood trellis. Wire links climbing vines to the trellis. 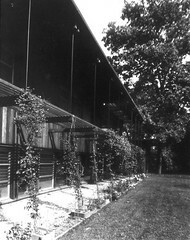 In the summer, the deciduous vines provide additional shade for the South facing glass, supplementing the horizontal roof overhang and trellis. In the winter, when sunlight enters the home at a lower angle, allowing sunlight to penetrate the South glazing. Armstrong developed combined system of solar control over several decades working in the Midwest, with its extremes of weather.